Texas Comptroller Susan Combs’ office collected $2.03 billion in state sales tax revenue in the month of October. 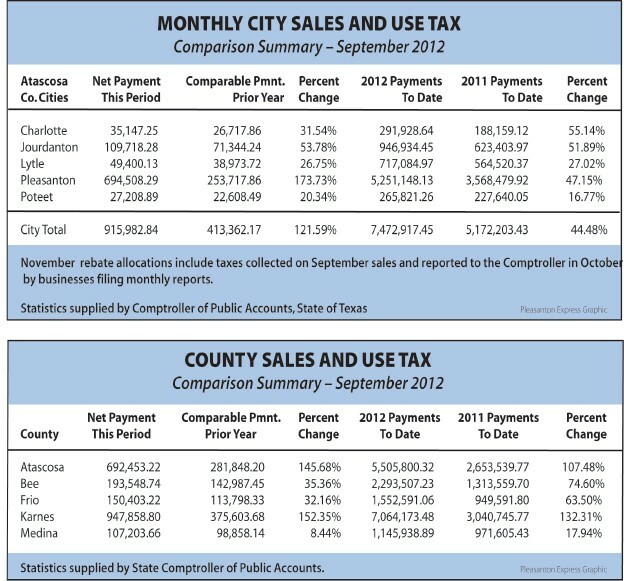 This is an increase of 8.2 percent over state sales-tax revenue collected in October 2011. Combs will distribute $611.5 million to cities, counties, transit systems and special purpose taxing district in November. Atascosa County will receive a sales-tax allocation of $692,453.22, an increase of 145.68 percent from its salestax allocation in November 2011. In the tri-city area, Pleasanton will receive $694,508.29; Jourdanton will receive $109,718.28 and Poteet, $27,208.89.